Quirky Girl has been creating!! Well as you can see they are now sweet earrings and necklaces. You need to be a little quirky to wear the earrings as they do not match and are both different colours, so only the quirky at heart could take that risk!! The rings sort of fell into being. I make vintage bottle tops into fridge magnets but I had a lot of bottle tops that I didn't like the design of, so again "What to do with all the left over ugly bottle tops?". With some of the left over resin that I had coloured I poured it into the bottle tops, unsatisfied I then added some cute little resin flowers...... and lo and behold I fell in bottle top ring love. 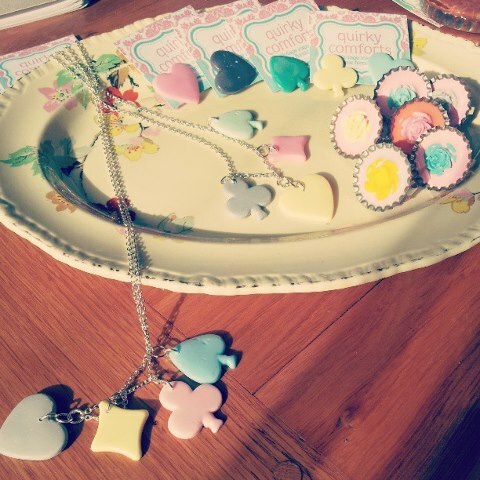 So join in the Quirky jewellery revolution and head down to Ma Belle Amie to get the first pick of these cute pastel designs. So whats next for Quirky Girls Blog? Coming next week is Quirky's Yummy Cafe Picks. Once a fortnight I will be sharing cafe interiors and you will also have the chance to win yummy prizes!!! So keep blog posted.